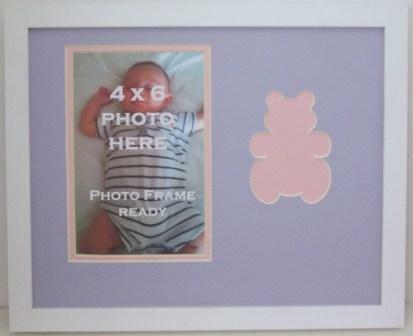 Children's photo frame overall size 8x10 with 4x6 photo opening. Unique carved image silhouette of a pink teddy bear includes double mats with lavender or light purple with a pink teddy bear. White wood frame, glass front, photo mounting board and wall hanging system is included with the photo frame. Photo unit includes a gift box.